The following new features have been added in Safari 9.0. Subframes can navigate the main document by setting the window.top.location property. Safari presents a confirmation prompt to open the application from custom protocol URLs. Important: You must resubmit your Extension to Apple before it will be displayed in the Extension Gallery. Online submission is available at https://developer.apple.com/safari/extensions/submission/. Use event.webkitForce to create interactivity with the following events and constants. Viewport meta tags using "width=device-width" cause the page to scale down to fit content that overflows the viewport bounds. You can override this behavior by adding "shrink-to-fit=no" to your meta tag as shown below. The added value will prevent the page from scaling to fit the viewport. Note: Apps containing content blocking extensions for Safari on iOS are available only on 64-bit devices, due to performance limitations of 32-bit devices. 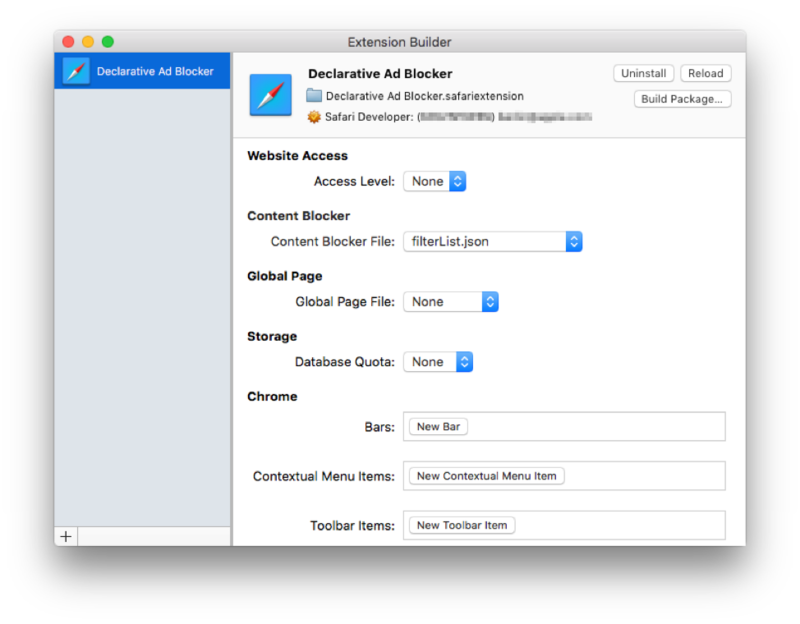 Content Blocking is now available on OS X through Safari. Add your JSON file in the new Content Blocker section of the Safari Extensions Builder, shown in Figure 1, or use the new setContentBlocker API available on the Safari Extension object. Note: The onbeforeload event and canLoad message for content blocking have been deprecated. Safari on both iOS and OS X now allow App Extensions that send items to Safari's Shared Links sidebar. Xcode offers templates for both iOS and OS X Shared Links app extensions. The sample in Listing 2 uses the template for OS X. // The keys of the user info dictionary match what data Safari expects for each Shared Links item. // You can use the NSExtensionItem's attachments property to supply a custom image for your link. Safari 9.0 lets you use CSS to match the wireless playback icon with the theme of your custom HTML5 video controls. Picture in Picture (PiP) maintains user engagement, allowing your video to remain in view in a floating video overlay while users interact with other apps. With Safari 9.0, when using the built-in video controls for HTML5 videos, picture-in-picture controls are made available automatically depending on device support. // Toggle PiP when the user clicks the button. For more information on PiP, see Picture in Picture Quick Start in Adopting Multitasking on iPad. Safari’s WebKit now provides CSS scroll snapping to keep the focal point of your content in view when scrolling momentum stops. The following properties are available to customize your page. The viewport comes to rest on a snap point at the end of a scroll operation. 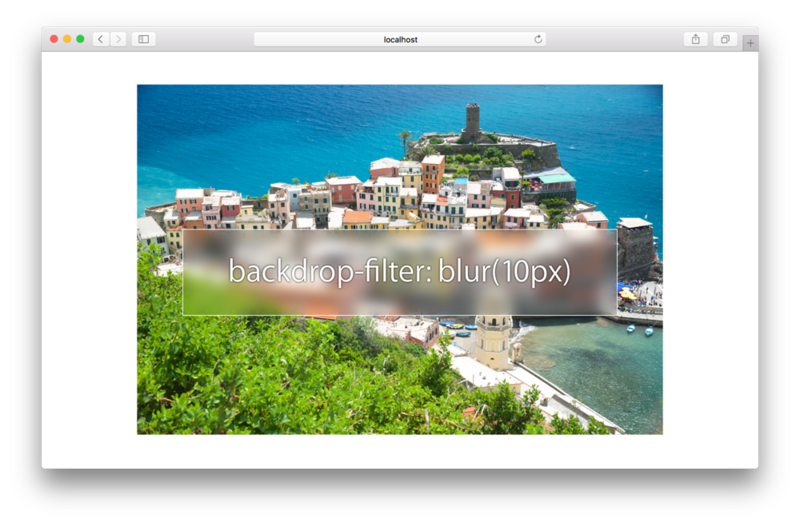 Backdrop filters allow you to add advanced image filters to the backdrops of your elements. 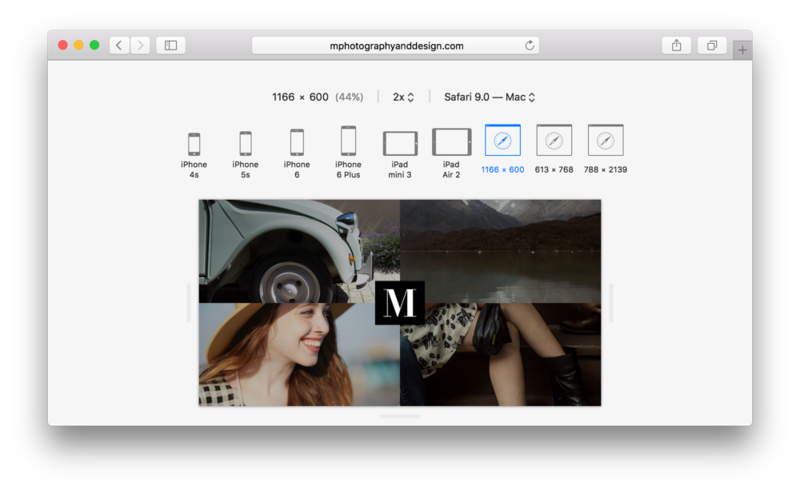 Achieve modern iOS and OS X material effects in your web content layouts using these filters. Figure 2 shows a backdrop filter with a blur effect applied to the overlay. W3C offers more information on filter effects at http://dev.w3.org/fxtf/filters/#typedef-filter-function-list. The Responsive Design Mode provides a fast-switching layout preview of your webpage across a spectrum of viewport sizes. This viewport quick-look tool helps you quickly spot layout issues on a webpage across many screen sizes. It includes several preset sizes for Apple devices, shown in Figure 3, and allows custom viewport sizes to be defined. 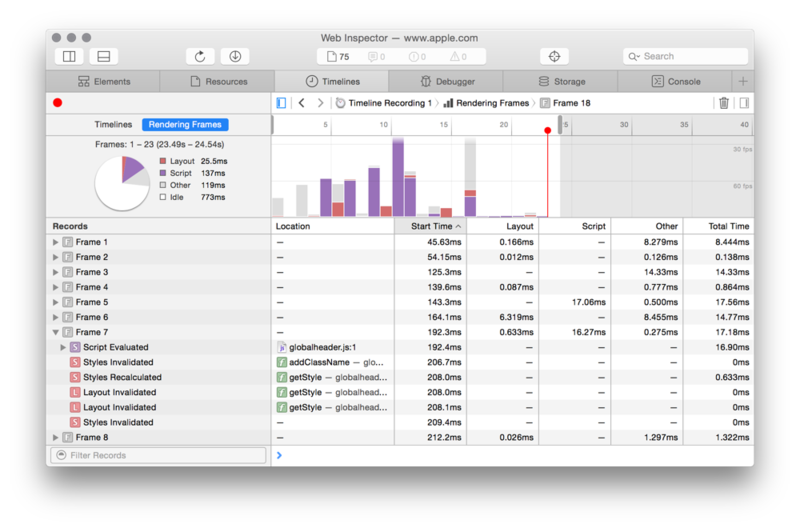 The new Web Inspector design provides a more intuitive user experience. The use of tabbed view panels keeps the user oriented and provides quick navigate between development tasks. A new frame rendering timeline, shown in Figure 4, makes it easy to see performance with respect to the frames painted to the page. Apple operating systems automatically switch between two optical, size-specific font families to accommodate the new system font, "San Francisco". You can use the following CSS rule to intelligently switch web fonts to match the operating system’s typeface. In addition to the font, iOS lets you specify the size and weight of the system text styles. Use the CSS font property with the newly supported text-style keywords below. The first number defines number of text lines the letter will span. The second number defines the number of lines the letter should sink. For more on the initial-letter property, see http://dev.w3.org/csswg/css-inline/#initial-letter-styling. The CSS3 enhancement, Feature Queries, use the @supports rule. See http://www.w3.org/TR/css3-conditional/. The following CSS4 selectors are now fully supported by Safari. The following properties are now fully supported by Safari, without the -webkit- prefix.